Candy Bar Blondies or Blondie Cookies? In a perfect world, you wouldn’t have to choose between a cookie and a blondie. I’m here to tell you that this world does exist! This recipe for Candy Bar Blondies bakes up the most amazing chewy, gooey, crackly edged blondies. But, that’s not all. The batter also makes the most divine ultra buttery, vanilla-y super thin, rich, crispy edged, tender centered Blondie Cookies. The recipe is quick and easy, and no mixer is needed. So technically there’s nothing stopping you from achieving your dream of cookies and blondies existing side by side, hand in hand (your hand that is). Candy Bar Blondies include chopped Twix, Heath Bars, and Rolos for that extra gooey, chewy texture. Blondie Cookies let the batter speak for itself and subscribe to the old adage that there’s beauty in simplicity. Melt the butter using a microwave or in a pan over the stove top. Set aside to cool a little. In a medium size bowl, measure out the flour, baking powder, baking soda, and salt, and stir together. In a large bowl, whisk the melted butter, brown sugar, and vanilla together until the mixture has slightly lightened in color and is well combined. Add the egg to the butter mixture, and whisk to mix well. Add the dry ingredients to the wet ingredients, and using a wooden spoon or spatula, stir together until the batter is just combined. Do not overmix to ensure a tender dough. Stir in the chopped candy bars. The batter will be thick. Bake for 24-26 minutes or until the top is lightly browned. Remove from the oven, and cool completely before cutting into squares. Prepare cookie sheets by lining them with parchment paper. If you don’t use parchment paper, you probably do not need to grease/spray your cookie sheet because these cookies have a good amount of butter to keep them from sticking. Follow Steps 1, 3-7 above. Skip step 8 as the cookies will be too thin and fragile to handle the candy bar pieces. Let the batter rest at room temperature for 30 minutes. It should thicken up a bit. Using a teaspoon scoop, space the rounded dough about 2 inches apart on the prepared cookie sheet. Make sure to leave enough room between dough balls as the cookies spread a bit during baking. Bake for about 8 minutes until the edges of the cookie have barely darkened. Remove the cookie sheet from the oven, and let the cookies cool on the cookie sheet for 8 minutes until they are firm enough to transfer to a cooling rack. Transfer the cookies to a cooling rack, and cool completely. Note: The blondies/cookies can be stored in an air tight container at room temperature for up to 5 days. I had extra special visitors in town earlier this year, so of course we had to bake something ridiculously sweet and addictively delicious. My dear visitors share my love of Twix candy bars, so we made a homemade version with buttery, tender shortbread, a chewy, thick layer of caramel, and a smooth, dark chocolate ganache. Even though there are three separate components to this recipe, each is quick and easy to make (the caramel is is made from Kraft caramel squares). In a medium-sized bowl, beat together the butter, sugar and vanilla. Add the flour. At first the mixture may seem dry, but will come together as you continue to beat at medium speed. Take the dough (it will be somewhat stiff) and press it evenly into the pan. Lightly flouring your fingertips will help with any sticking. Bake the crust until it’s lightly golden brown on top and the edges are deeper golden brown, about 35 to 45 minutes. Remove from the oven and immediately run a knife around the edges to loosen the crust. Set it aside to cool completely. Melt the caramel and cream over low heat in a small saucepan [or with short pulses of heat (20-30 second increments) in the microwave]. Pour the caramel over the cooled crust and set in the refrigerator for 30 minutes to chill and firm up. Melt the milk or dark chocolate [I prefer dark chocolate] slowly in a double boiler or over very low heat. Pour evenly over the chilled caramel layer and spread to cover all of the caramel. Return to the fridge until the chocolate is well set. Note: It’s best to store these bars in the refrigerator. These bars can also be cut and dipped in milk chocolate to resemble Twix bars. After the caramel layer has chilled firm, cut down the length of the pan, splitting the bars into two long, narrow bars. Then cut each long strip into “fingers”. Dip the chilled bars into melted chocolate and place on parchment paper to set for several hours. 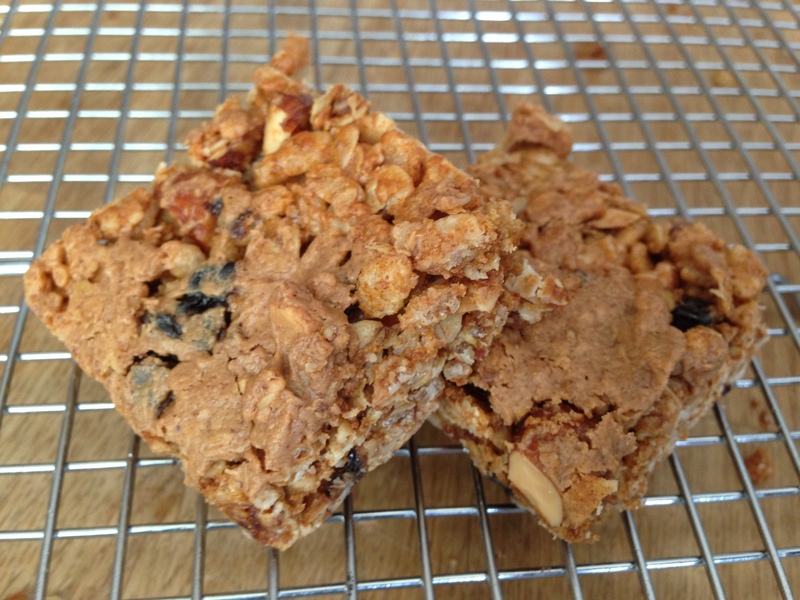 If you’ve been only eating store bought, packaged granola bars, then you’ve been doing it all wrong. These homemade granola bars are packed with oats, rice krispies, smoked almonds, almond butter, dried cherries, and honey, and they’re quick and easy to make. Just measure, melt, stir, bake, and eat- no fancy equipment needed. You can customize the type of nuts used (I also like using salted hazelnuts and cashews), dried fruit (dried apricots and cranberries are also among my favorites), and nut butter (I use almond butter because I can’t do peanut butter). The bars are barely sweet, but you can sweeten them up with a more generous drizzle of honey after they’ve baked or even a swirl of melted chocolate, Nutella, or whatever makes your sweet tooth sing. Combine the oats, rice krispies, chopped almonds, salt, baking soda, and chopped cherries in a large mixing bowl. In a large glass measuring cup (or microwave safe bowl), combine the honey, 1/2 cup almond butter, and coconut oil. Microwave for 30 seconds to 1 minute, and stir to mix well and ensure the coconut oil and almond butter have melted. Add the vanilla and brown sugar to the coconut, honey, and almond butter mixture. Whisk to combine. Pour the wet ingredients over the dry ingredients and stir to mix well. Pour the oat mixture into the prepared pan. Flatten the mixture into the bottom of the pan. I start out by pressing down on the oat mixture with my hands to distribute it evenly throughout the pan. Then I place a sheet of parchment paper over the top of the oat mixture and use the bottom of a large measuring cup (or any other object with a solid flat surface) to press down on the mixture and pack it down. Microwave the remaining 2 tablespoons of almond butter for about 30 seconds (until it liquefies enough to be poured/drizzled). Drizzle the almond butter over the top of the bars. Bake for 20 to 25 minutes until golden brown on top. Remove from the oven, and cool in the pan for 10-20 minutes, until if feels firm but still somewhat soft enough to cut. Note: if the bars haven’t cooled enough, they won’t be firm enough to cut into bars and will crumble. But if you wait too long and they’ve cooled and hardened too much, they may shatter a little when cut into bars. It’s a bit of a guessing game, so a little trial and error is needed. Remove from the pan and then cut into bars. Don’t worry if some of your bars break apart a little or seem a bit too crumbly when you cut them. Press/mold the bars back into shape, and when they’re fully cool, they should harden a little more and hold together a little better. And if you have smaller pieces that are too crumbly to hold up as bars, they’ll still be delicious to eat sprinkled over yogurt. Place the bars on a cooling rack to cool completely. Store in a sealed container or wrapped in plastic wrap.